While there are other EQ and boost pedals that can do a similar job, this one scores by having a well-thought out feature set with the preset amounts of EQ and boost, and the individual switches for them. Clear vision of exactly which elements are engaged. Practical amount of nice-sounding boost. It’s rather expensive for the genre. While it’s always possible to use just one guitar for the entirety of your gig, many of us prefer the tonal flexibility of having a choice of instruments to draw upon. That might be a luxury enjoyed by touring bands with their own guitar tech, but two is a practical consideration: one equipped with humbuckers, and the other single coils, for example. As anyone who has swapped between a Les Paul and a Stratocaster on stage will know, a compensatory amp tweak might also be needed: more volume for the Strat’s single coils, or a bit of bass roll-off for those Les Paul ’buckers. Of course, a pedal that incorporates a boost/cut and/or EQ change could do the job instantly. 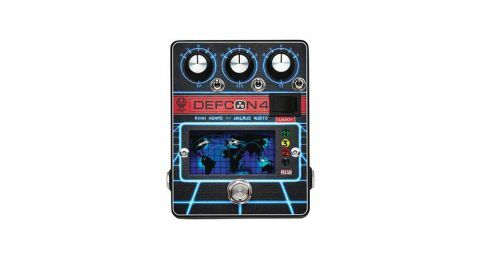 And that’s one primary role of the Defcon4: a preamp and EQ pedal developed by the Walrus Audio team with American singer/guitarist Ryan Adams in order to make his regular onstage switches between Les Paul and Strat completely painless. Besides that, though, what you’re also getting is a pedal that can give you tonal sweetening and a kick-up when a song calls for it. The design of the Defcon4 has its roots in Adams’ love for all things 80s and in particular the 1983 movie that inspired its artwork, WarGames, most notably in the inclusion of a blue backlit world map, complete with missile trajectories, rather than a standard bypass LED. There are four elements to the Defcon4 pedal’s sound-shaping capabilities, each with an individual switch on the pedal coupled to an LED showing its on/off status. Whichever combination of the four is active is what you get when operating the bypass footswitch. First up is the Launch switch (Defcon 1, white LED), a 10dB MOSFET boost. This is very useful for giving extra bite to lower-output pickups should it be needed, but it can also be a workable quick boost for solos, adding a little more volume and grit in front of your amp. The other three elements are EQ bands. Each has a rotary switch with five options: Flat EQ, two strengths of frequency boost, and two of frequency cut. From left to right you get Low (IV), Mid (III) and High (II) EQ. These are all very nicely voiced, concentrating squarely on frequencies that are most relevant for guitar with sensible amounts of cut and boost - proper tone- enhancing EQ. Referred to in the manual as a “Strat Fixer”, the Defcon4’s EQ certainly multiplies the tonal options available for our Strat, sweetening the tone in all five positions and especially for the tone-knob-free bridge pickup. The bass knob alternately thickens things up or rolls off some low-end for more clarity, while the High knob can tone down spikier sounds or bring out some extra glassiness. The mid-band EQ can be set to taste-tweaked to suit your needs via a set of internal trim pots adjusting the centre frequency of the mid-band from 3kHz to 300Hz with a median position of 1kHz, while the Q (bandwidth) can be set in the range from 0.3 to 2.5. As shipped, the pedal comes with Ryan’s settings, clearly marked in the manual if you need to come back to them. Those settings with the centre frequency just north of 1kHz let you tweak the presence of the sound, maybe mellowing out some harshness or pushing the sound forward for soloing, but there are other options if you don’t mind getting handy with a crosshead screwdriver. If you do use different guitars on stage, putting this pedal between guitar and amp will let you quickly call up a tweak for consistency. For no-brainer functionality, set your amp for your Les Paul and set the Defcon4 for the compensatory boost and EQ tweaks needed when switching to your Strat - swap the guitar over, hit the footswitch and you’re good to go. Walrus Audio offers up an extremely practical pedal that’s equally good for tonal compensation when swapping between guitars, giving you a footswitchable consistent EQ change and/or boost when needed, or simply adding enhancement to your guitar’s inherent tone. While there are other EQ and boost pedals that can do a similar job, this one scores by having a well-thought out feature set with the preset amounts of EQ and boost, and the individual switches for them.